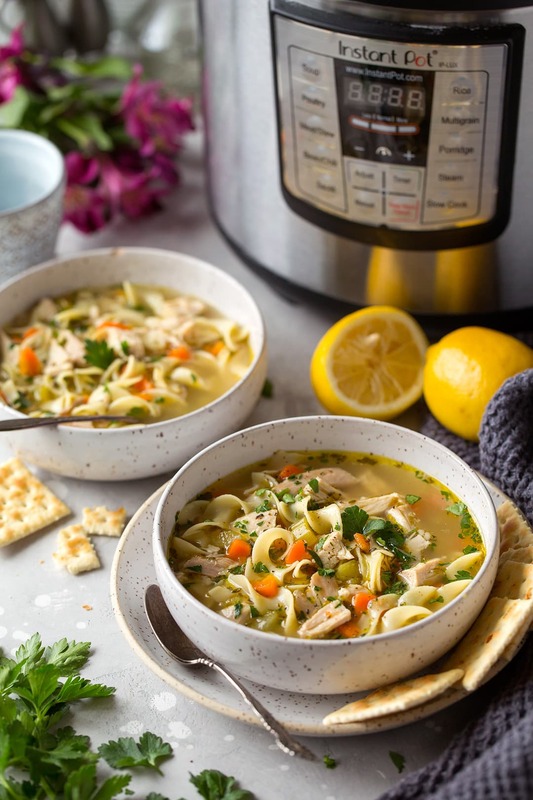 Chicken Noodle Soup made in the Instant Pot will quickly become a go-to family favorite! 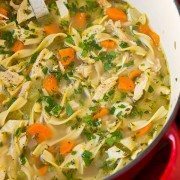 As a matter of fact it’s probably the easiest and best chicken noodle soup I’ve ever made! It’s so simple to throw together and it’s ready in no time. The pressure cooker does most of the work! When you’re sick what’s the only thing you want? 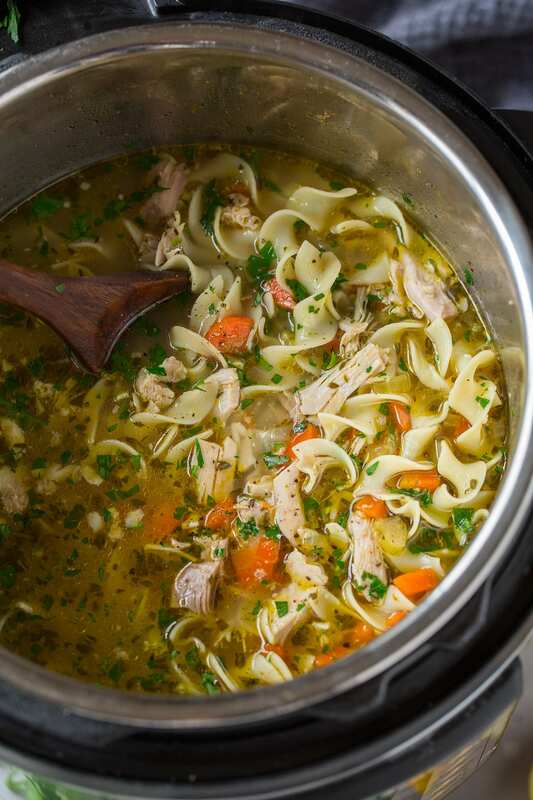 Chicken noodle soup. Okay and if you’re me maybe some ice cream to wash it down. 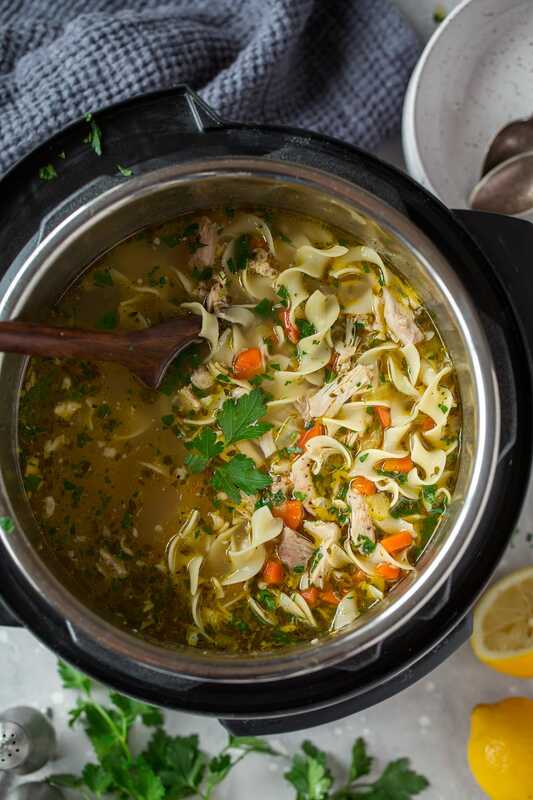 But really homemade chicken noodle soup is one of my go-to dinners and not just for sick days. 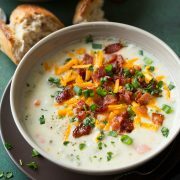 It’s so nice to sit down to a big bowl of this after a long day. 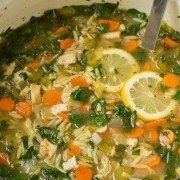 Plus I love that my whole family loves chicken noodle soup so I make it a lot. I don’t get the “Mom, how many more bites” 30 seconds after we’ve sate down to eat. My kids actually even request it for dinner. And we love it with some fresh toasted and buttered sourdough bread. Bread and soup just go hand in hand don’t they? Drizzle in olive oil then add in carrots, celery and onion saute 2 minutes. Add garlic and saute 1 minute longer. Add in broth, thyme, rosemary, bay leaf and season with salt and pepper to taste, then add in chicken. Press “cancel” on Instant Pot turn turn off saute mode. Cover and close lid and make sure the vent on the lid is set to “sealing” position. Select “manual” (or high pressure on other pressure cookers) and set to 10 minutes. Once time is up let the pressure come down naturally for 10 minutes then carefully use the quick release method to release any remaining pressure. Add noodles and let cook, uncovered, until noodles are tender, about 5 – 6 minutes. Meanwhile shred chicken. Once noodles are done, stir in lemon juice, parsley and chicken, serve warm. I’m guessing this will be the new most frequently made version of chicken noodle soup it at my house. It’s just that good! The Instant Pot gives you that homestyle flavor and fully tender chicken. (If you are interested in buying an Instant Pot you can get them on Amazon). The cook time here really is only about 20 minutes but there’s also the 10 minutes (approx.) it takes for the Instant Pot to come up to pressure and the 10 minutes to release pressure. Even if you don’t normally cook with chicken thighs definitely give them a chance here. They add great flavor, they won’t overcook here, they become perfectly tender, and the bones in them also great flavor. But skip the skin, like I mention in the recipe, it doesn’t have much to offer anyway unless it’s browned. 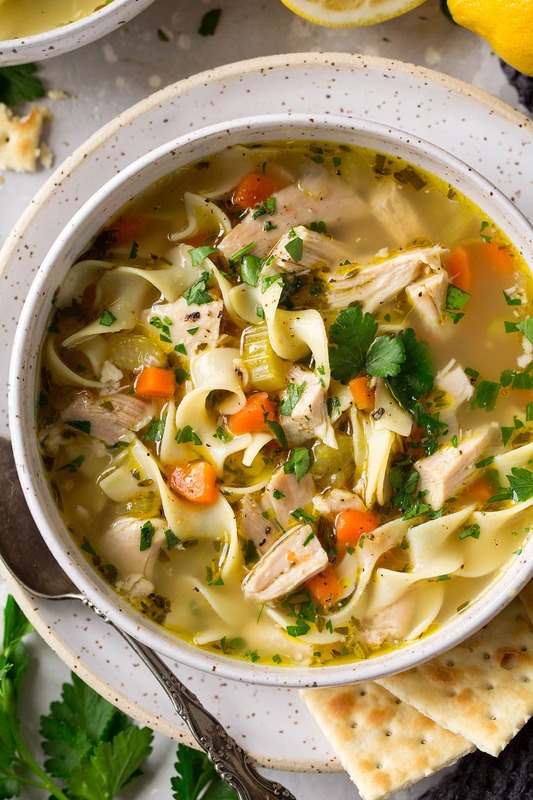 This is likely to become your new go-to chicken noodle soup! So easy to make yet the end result tastes amazing! 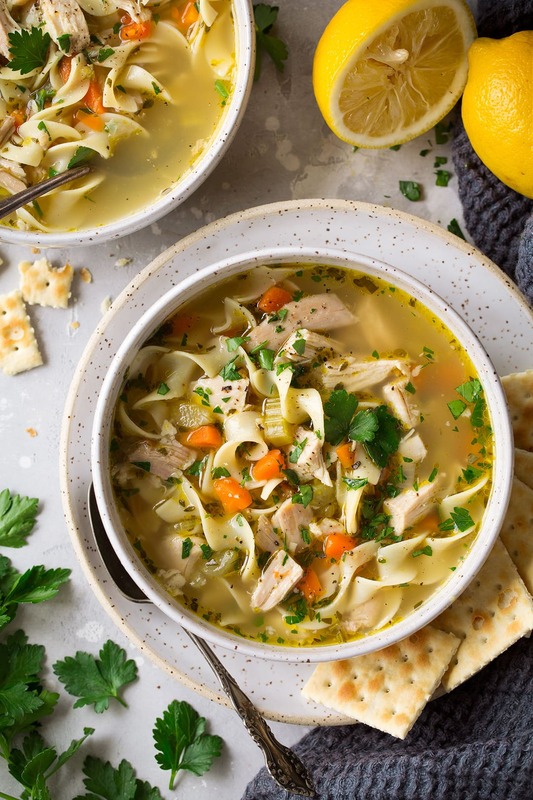 It's a homestyle chicken noodle soup everyone will love, and you'll love how the Instant Pot does almost all of the work. Select the "saute" setting on the Instant Pot and let heat until the label reads "hot." Add in broth, thyme, rosemary, bay leaf and season with salt and pepper to taste, then add in chicken. Press "cancel" on Instant Pot turn turn off saute mode. Cover and close lid and make sure the vent on the lid is set to "sealing" position. Select "manual" (or high pressure on other pressure cookers) and set to 10 minutes. Remove chicken and transfer to a cutting board. Press "cancel" on the Instant pot then press "saute." Add noodles and let cook, uncovered, until noodles are tender, about 5 - 6 minutes. *I prefer this soup without the skin, it's much less greasy. But the bones add flavor so don't just go for boneless thighs. To skin the thighs simply start from one corner and pull the skin off, use a knife to trim away any portion that is stuck on. Look for the fresh poultry herb blend so you don't have to buy thyme and rosemary separately. You can also use dried if you don't want to pay for fresh, use a heaping 1/2 tsp of each. Jaclyn: Wait to remove the ring until just before serving (until completely chilled through). Hope you love it!